Emporio Armani Classic Quartz AR2463 Men’s Watch, this watch is mix of bold design, attention to details and an elegant gunmetal toned case. A merge of modernity with fashion for both men and women. The watch does not boast of too many features like other designer watches, nor does it boast of any innovative technicalities, which will make it standout in the crowd. A distressed leather band of 22mm width looks good and chic on the wrist. A 43 mm width diameter of the dial is white and simple with only the markers and no numbers makes the dial clear and legible enough. And the 6 o’ clock position shows the calendar with the date only. The 50-meter water resistance is apt for a light swim. 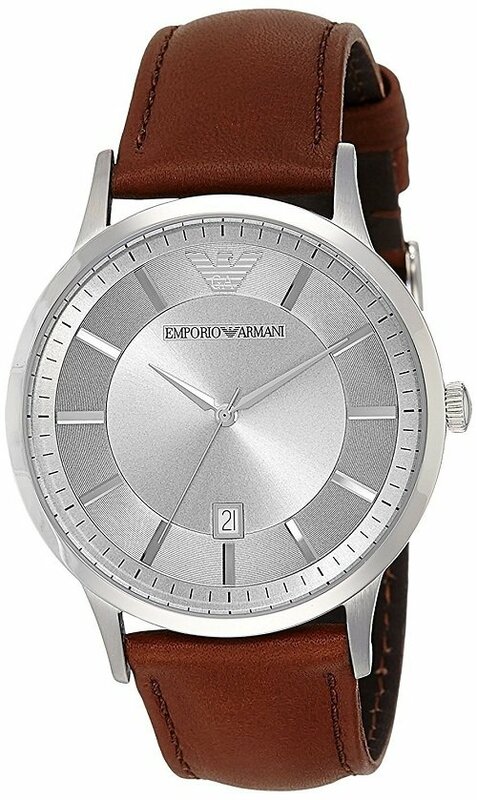 Emporio Armani Classic Quartz AR2463 Men’s Watch a plain and simple working watch, which handles no, fuss at all. It likes to be as plane as it looks. Many may agree that this watch is more of a statement watch that shows off the brand than the complexities. Emporio Armani thus is producing simple clean lines, which can be said as the minimalist style quartz watches. The case is made of pure steel with gunmetal toned. Rather it is a slim watch. Anyway, the case is clean with a decent mirror polish finish and I do not see any blemishes or anything of that sort. The case back is fitted with a Pop-On style caseback, which holds the Battery, and Quartz movement that powers this three handed quartz timepiece. The model has probably one of the simplest and cleanest dials you can have on a watch. We have two hands, one hour hand and one minute hand. There are also applied indices going around this circular white dial. The Emporio Armani Classic Quartz AR2463 Men’s Watch is sporting a very simple, reliable, and practical Japanese Quartz 3 handed movement. These movements typically last around 2 years with their battery life, and gain around 5 seconds a month. I believe one of the strongest points of these watches are their genuine leather straps. They certainly do the wrist justice and are quite supple and do not require much of a break-in period I have found. I have experienced the straps similar brands. They are also equipped with a stainless steel polished buckle and signed with the Emporio Armani Wrist Watch logo. Overall, this is rather lower than some of the other equivalent brands in this market. I think the price is fair and if you are a fashion/trendy man or simply want a watch that looks good, will work without hesitation, and does not break the bank, the Emporio Armani Sportivo Chronograph Tachymeter Quartz Men’s Watch could be an option to consider for yourself. Bottom line: A good value for money for those who want to be in the old school classic age, with no added technologies and with an old world charm. A smart simple formal looking timepiece that does not involve the intelligent brains and let it worry for something more.